As a result, your visitors will not be able to visit the correct page and it’s possible they will get a 404 message. 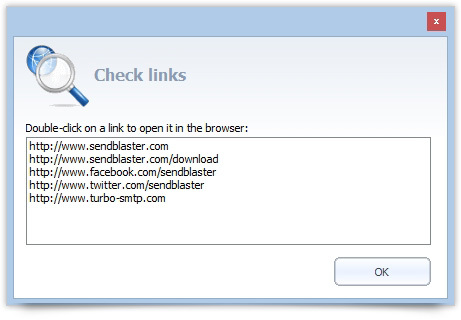 The Link Checking tool, introduced for the first time in SendBlaster 3, is very simple but it makes your life easier! In fact, it automatically extracts all links, even the hidden ones, from your newsletter message in one click and lets you check them. When you have finished composing your message and you think you are ready to send it, click on the Checking Links icon in the Compose panel. A pop-up window will appear and it will show the full list of links found in your html email message. Now double-click on each URL address to open them in your browser. You will be able to test your pages to make sure that all your links are correct. If you find out one or more invalid links, go back to your newsletter message to fix them and then run the Checking link tool again. By performing this quick operation you’ll be sure not to miss a single broken link anymore.